After basic training at Fort Snelling, Minnesota and Camp Roberts, California, I was shipped to Camp Meade, then to Camp Shanks, New York. I sailed on the Ile de France to Europe. We landed in Glasgow, Scotland, took a train to Southampton, England, and then crossed the Channel to France. It was a long hike, and then some trucks to what was to be G Company of the 8th Infantry Regiment, 4th Infantry Division. Along with many replacements, we arrived shortly after the 4th Division had entered the famed, or not so famous, Huertgen Forest. It was a real baptism, and those who lived through it will never forget. I joined G Company in the Huertgen Forest along with Archie L'Heureaux. We were assigned to an outpost just several hundred yards from the enemy and, a long way ahead of the main part of the Company. It was quite a shock. On our second day at this outpost some very severe shelling took place on and near our position. We were well in our covered foxhole when a mortar landed right in front. Archie had an ear about severed off by a piece of shrapnel and, I got a good bust on the bridge of my nose. He was bleeding quite badly and started back for the aid station, while I stayed. It was nearly dark when he returned all bandaged, and ready to do battle. Too darn dark for me to try and find the aid station in those forbidding dark trees, so I decided to stay until morning. By then it was forward march, so we pushed on and jumped off in an attack. It wasn't too long before I forgot about my nose. In a close fire fight through the trees sometime the next day, my buddy beside me, Robert Eckman, got some shrapnel from a tree burst. A large chunk went through his back and chest wounding him severely. Robert DeVaro got shot in the seat of his pants and took a bullet in one of his buns. I had quite a time getting a bandage on him before helping him to find a medic. He must have been facing the wrong way. When we located the medics, I told them of Eckman and where he was, with their assurance they would pick him up. Many others were killed and wounded. After the first day, a count found Gus LePre and myself were the only two left in our squad. Several days later, another count found that of the 40 replacements that came to the Company when I did, only 6 were left. This is the way it went day after day. Some days the casualty list was not as high. After numerous skirmishes of this kind, and many shell bursts that decimated the ranks, I was holed up with another Frenchman. 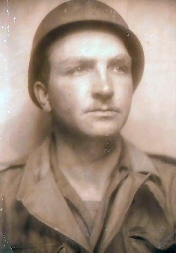 His name was Roland J. Marquis, and was later killed in action on a hill near Hermespand when the enemy had the misfortune to have us surrounded. It was during this Huertgen battle that our regular radio operator, Shady Wires, was wounded. The Platoon Sergeant sized a few of us up and decided I had the strong back and weak mind to carry the SCR 300 for the Company. I went back to Battalion Headquarters for a ten minute course on the radio's operation. From then on until the end of the war, that radio was my baby, and I grew to both love and hate it. It weighed about 45 pounds - that, plus the other gear I had to carry. Trying to keep it dry in the vet and snow was a little more than I bargained for. 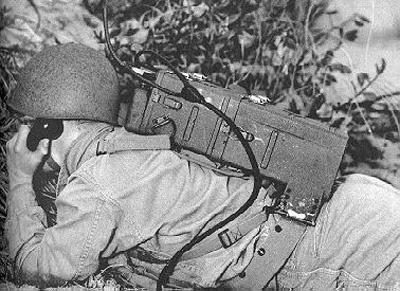 But then, when in those cursed woods, with no foxhole to hide in, that heavy radio on my back was some protection against tree bursts. This radio was the link between the Company Commander, other Companies in the Battalion and, Battalion Headquarters. A deep affection was born of this tie with Captain George K. Devine (Andy) of G Company, Greenip of H Company, Battalion Commander George Mabry, S-3 John Swearingen, and others whose names escape me at this time, 45 years later. I was also fortunate to become very well acquainted with the other officers in G Company and a few from other Companies. One of the finest compliments that came to me later on was at a crucial time when G Company was in trouble, and Captain John Swearingen said to Major Mabry, "Let's get California's radio, as I know for sure his will work." Now, for an explanation. When I arrived at the Company, they asked my name and where I was from. Naturally, with my name (unpronounceable), and my temporary home being California — that is the handle I was given. It stuck with me till hostilities ceased. In arriving at G Company as its Radio Operator, I naturally was foxholed with Captain Devine. We discovered that a friend of mine from a nearby town in North Dakota was a terrific mile runner, went to some college in Iowa, and became well known. His name was Bill Feiler. Being so close to the Company Commander, I became knowledgeable about where and when the next attack would take place, who was point, and who was in reserve. I learned what the objective would be, even though I could never find it with an Indian tracker. Many times during an attack, which often took place during darkness, we would halt and Devine would crawl under a blanket with his flashlight to be sure the point patrol was on the right track. During one such assault, he made a quick check and hurried to the front of the line to get them to go right instead of left. Lo and behold, when all got squared away, and daylight broke, we were all in the right place, the back slope of a hill. It was unfortunate that more of our men didn't know of the quality leadership. or distribute any of this material without prior written permission of the copyright holder.